With reference to the letter TVU/R/International day of yoga/2018/1142 and by the direction from the university, A massive celebration was organized in the presence of the chairman of the college, the principal and the chief guests from Arivuthirukovil, Neyveli . The Chief guest addressed the session followed by the chairman and the principal wherein he meticulously outlined the benefits of yoga to provide students a 360 degree view of unexplored benefits of yoga. More than 500 students and faculty members gathered to be a part of this mass movement and to learn about the iatric benefits through various yogic practices. In order to pay tribute to this ancient Indian tradition in its truest sense, the event included traditional meditative sessions, informative talk by the chief guest on the origin and adoption of yoga as a mass culture and practical sessions of yoga for students. The event gained momentum with remarkable response from participants who embraced this philosophical ascetic practice religiously and performed attentively to the instructions of the experts. 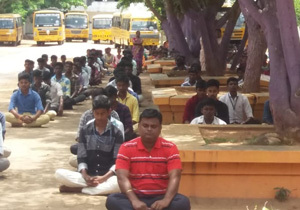 The yoga sessions were conducted by Yoga instructor from Arivu Thirukoil, Neyveli who stressed upon the importance of integrating yoga with our daily lives and how youth can reap the benefits by practicing yoga regularly. Thiruvalluvar Arts and Science college has been consistent in initiating awareness campaigns to address the importance of physical and mental health and has always encouraged students to learn the value of life-skills and conscientiousness. The festival of Samathuva pongal was celebrated on 12th January 2019.The celebration was presided over by the Principal of our college, Dr.V.Ramnath, our beloved Chairman R.Sattanathan, Treasurer T.Ramalingam and Advisor A.Asaithambi. The chief guest of the function Mr.Prasanna Sub Inspector, of kurinjipadi division addressed the students with his inspirational speech. The students came up in their traditional dresses and exhibited joy and pride which filled the campus with the lands cultural aura. The celebrations included competitions like Kabbadi, Volley ball for boys and Rangoli, Preparation of pongal for girls. The students also showcased their skills in silambattam, Karakattam and Oyilattam. Price winners of various competitions were awarded with trophies and certificates by the chief guest Mr.Prasanna. Our Vice Principal Mr.P.Manivannan delivered vote of thanks. The management also thanked all the departmental staff members and students for their kind Co -operation for the successful celebration of samathuva pongal festival. The 70th republic day of India was celebrated with gaiety and patriotic fervour at Thiruvalluvar Arts and science College, Kurinjipadi amidst the foggy morning of 26th January 2019. The ceremony took place in the presence of our principal Dr.V.Ramnath, The chairman of our college Mr.R.Sattanathan, HOD's of various departments, faculties staff members and students. The ceremony commenced with the unfurling of the national flag by our principal Dr.V.Ramnath followed by the national anthem. In his speech, Our principal highlighted the importance of the constitution and its unique features such as sovereign, secular, Democratic and republic enshrined in the preamble of the constitution of India. The chairman of our college Mr.R.Sattanathan underscored the steps the college has taken to ensure an overall development of its students and took pride in mentioning that the college is well ahead of the academic standards that are being enforced by the government. He emphasized upon the quality education which would help in the development of the state and the country. The hour long ceremony culminated with the distribution of sweets.